The Phi Phi Island of Phi Phi Lei houses one of Thailand's most beautiful beaches: Loh Samah Beach. Not only is this one of the most stunning beaches in Thailand, but also one of the most beautiful beaches in the world. Although the island is uninhabited, it is one of the most breathtaking to take a vacation. The tropical paradise of Phi Phi Island is composed of two islands: Phi Phi Don and Phi Phi Ley. Although Phi Phi Don is the main island, Phi Phi Ley has quite a bit to offer tourists. Loh Samah Beach is located on the much smaller island of Phi Phi Ley. Since this entire island is surrounded by limestone walls, very little damaged was sustained by the tsunami. To this day, the island and beaches shine like a precious gem. Although the Phi Phi Ley island is uninhabited, it is still a common stopping destination for tourists and diving trips. Most diving trips stop at Loh Samah Beach since the southern coastline bay provides shallow diving for beginners. The cliffs and caves can also provide shelter from the sun and rain. More experienced divers head towards the seaward side of the Loh Samah Beach pinnacle because the current can be fairly strong. The Geography of Loh Samah Beach is quite grand. Instead of a gradually sloping, sandy beach, this island has tall cliffs that immediately jut out into the water. Perhaps this is the reason the island of Phi Phi Ley was never inhabited by anything accept birds. These cliffs are made of magnificent limestone that house several caves. One of these caves is the famous Viking Cave. This is a spot where Phi Phi Island locals climb treacherous cliffs without the aid of harnesses. Inside the bay, the Loh Samah Beach has a sandy bottom. Snorkels and divers can follow the limestone walls right out of the bay where depth can get up to 20m. Underwater, there is an amazing gorge that is recommended for fantastic Phi Phi Island night-diving. 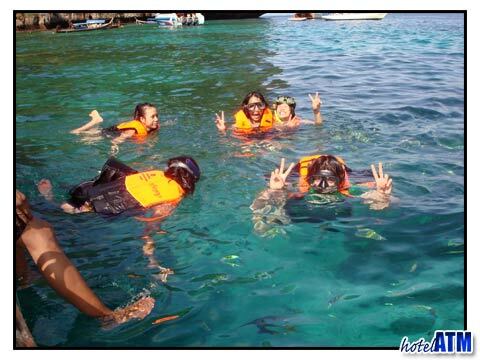 Phi Phi Island is one of the most popular tourist destinations in Thailand. It is home to some of the most awe-inspiring beaches, such as Loh Samah Beach. Being uninhabited, this beach can provide the tranquility and serenity of nature, but also the thrills of cliff climbing, snorkeling, and diving.